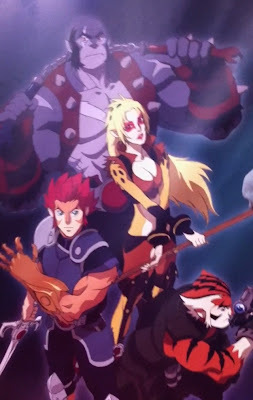 Trending on twitter and across the blogosphere is news of a reboot of the classic 80's cartoon/hybrid anime, ThunderCats. Bleedingcool.com reviled this first image from the series. As some of you know, ThunderCats was indeed an anime as the animation was done in Japan but similar to say the more recent Boondocks..it's production and script where of western origin. This newer version is being drawn by Studio 4°C, the same people responsible for SPRIGGAN, and some of The Animatrix. Cartoon Network supposedly is going to air this year and yes, Larry Kenney is again voicing the role of Lion-O. No image of Snarf found yet but don't rule him out yet...I mean come on, what's an anime without a comic relief mascot... snarf, snarf.